As investigators comb through evidence from the scene of the explosion that injured 29 people in New York City’s Chelsea neighborhood on Sept. 17, video surveillance has emerged of the moment leading up the blast. Footage of a man planting a pressure-cooker bomb near a dumpster just before the explosion is depicted in one of the videos, reported CBS News. Another video shows the same man at the second scene of West 27th Street, where an unexploded improvised explosive device (IED) was later found, “carrying what appears to be some type of case,” reported the network. On Monday morning, Mayor Bill de Blasio appeared on “Good Morning America,” where he told George Stephanopoulos that the safety of New Yorkers is the city’s main priority. De Blasio also asked that New Yorkers remain alert amid the investigation. The FBI and NYPD announced it had identified a suspect in connection with the Chelsea explosion—Ahmad Khan Rahami. Rahami, a 28-year-old naturalized U.S. citizen from Afghanistan, is being sought for questioning for the recent bombings in Seaside, New Jersey and the five explosives found in a backpack near a train station in Elizabeth, New Jersey, according to CBS News. Rahami’s last known address was in Elizabeth, New Jersey. In an appearance on “Fox & Friends,” Governor Andrew Cuomo confirmed Rahami is a suspect. 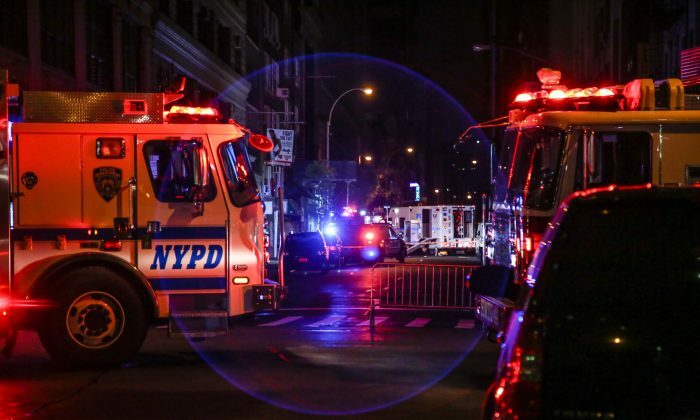 Saturday’s night explosion reportedly occurred at 1535 23rd Street between Sixth and Seventh Avenues at around 8:30 p.m., according to police commissioner, James P. O’Neill. The homemade pressure-cooker bombs contained shrapnel and a cellphone was utilized to detonate the device, said police. Videos released by Orangetheory, a Chelsea fitness center showed the moment the bomb detonated nearby, resulting in the shattering of its doors. The fitness center located at 124 W. 23rd St. released a statement via its Facebook page. “Due to the explosion, Orangetheory Fitness Chelsea is closed and will re-open as soon as possible. Fortunately there were no injuries to our members, coaches or staff, and our thoughts and prayers are with those who were affected. We are working with local authorities to help as much as possible to determine what happened,” the statement read. The investigation into the bombing continues.